FlexTech Solutions is one of the largest providers of diversified consumer and enterprise electronic services. We measure success through client focused premium service and flexible processes that enable cost effective long term partnerships. 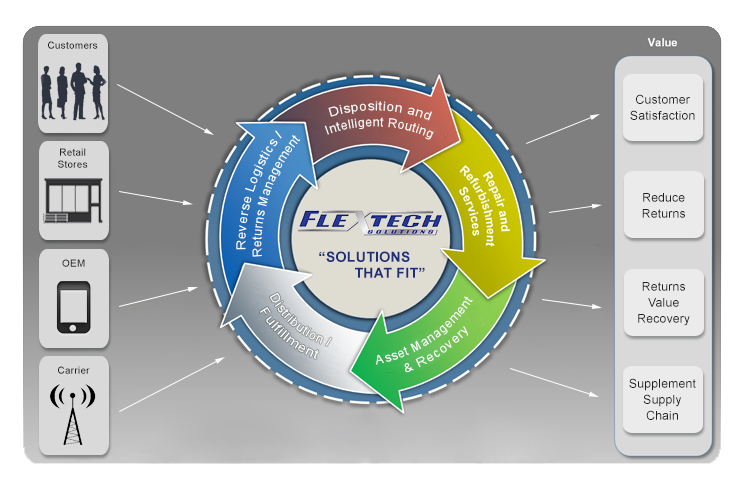 FlexTech Solutions offers a "total solution" approach to all your reverse logistics needs. Thank you for your interest and "We want your Business", we look forward to being of service to you. Please click on the contact us link below or give us a call, we will respond as soon as possible. We look forward to doing business with you! Flextech Solutions is always looking for dedicated and creative people, as we know you are the secret to our success. If you are looking for a career in an exciting and growing industry, please send your resume to employment@flextechsolutions.com. We look forward to hearing from you!